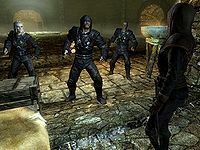 If you join the Dark Brotherhood and the Thieves Guild, and are on the quest The Silence Has Been Broken, another dialogue option will be available when speaking to Delvin. 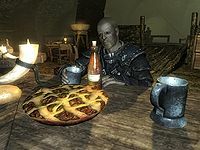 When you tell Delvin that you're seeing him on Dark Brotherhood business, he will remark: "Oh. Oh I see. Well, you're makin' friends all over, ain't ya? 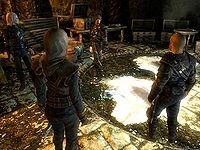 So, uh... how is Astrid doing' these days? Tell her to stop by some time. We can have a drink. Catch up. Ah, but business! Of course. What kind of business?" 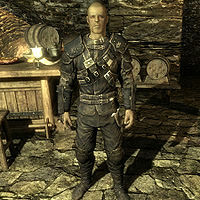 If you are not a part of the Thieves Guild when completing the quest, when you approach him, he will initiate the conversation by telling you: "Ah, now you must be lost. Best ya scurry off while you're able. The Ratway, well, it has a habit of swallowin' up the uninvited." 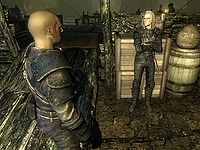 Telling him the that the Dark Brotherhood requires his services, he will respond differently: "Oh. Oh I see. 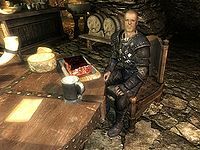 Well now, how is Astrid doin' these days, uh? Tell her to stop by some time. We can have a drink. Catch up. Ah, but we can discuss that later, yeah? What does the Brotherhood need?" 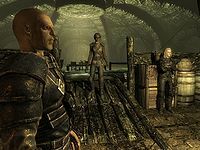 Once you've completed all four of the special jobs available in the major holds and Darkness Returns, the quest to become the guildmaster of the Thieves Guild, Under New Management, will begin. Esta página foi modificada pela última vez à(s) 17h45min de 29 de julho de 2014.